Our diamond inventory includes the MOST ECO-FRIENDLY SELECTION of beautiful HARMONY Diamonds and HARMONY Canadian Diamonds! Read below to learn about our HARMONY diamonds. A HARMONY diamond is a natural diamond that was mined from the earth; however, these diamonds have already been introduced into the jewelry supply chain and sold back to a jeweler, pawn shop or refinery for resale. In the past, these diamonds were simply reintroduced into the jewelry market with other newly mined stones. 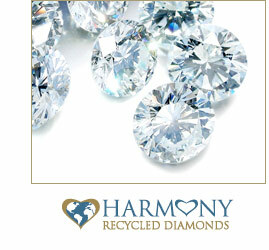 No recognition was given to the fact that these HARMONY diamonds are the most environmentally-conscious stones available! All HARMONY diamonds are certified by an independent lab for certification and grading, and are as good as newly mined diamonds! These diamonds are being offered to you at fantastic savings compared to newly mined diamonds with the same characteristics. Save money and do something good for mother earth by purchasing diamond engagement rings using HARMONY diamonds. *Because of the unique nature of HARMONY diamonds, inventory will fluctuate and change daily and the prices cannot be duplicated or used to compare with newly mined diamonds. We also offer certified, conflict free, diamonds from the Canadian Arctic. These HARMONY Canadian diamonds are mined in the Canadian North and responsibly cut and polished. Their production and sale are subject to strict standards, set out by the Canadian Code of Conduct, CanadaMark™, and the Government of the Northwest Territories, designed to protect the Arctic environment, mine workers and local employees. Known for their sparkle and clarity, HARMONY Canadian diamonds rank among the most spectacular diamonds currently available.